With the first day of the strike exhibiting much success, there was only an increased sense of motivation and fiery passion for the countless number of teachers, students, and parents picketing for the future of public education. The second day proved to be just as successful, despite the increased presence of police and overcast weather threatening to pour rain at any moment. Once again, everyone is in front of the school by 7 a.m., ready to spend another day picketing. Mixed in with the smell of rain on cement from the night before is the aroma of coffee and sweet donuts brought in by volunteers. Megaphones are blaring catchy chants, as the sea of people and picket signs move from sidewalk to sidewalk, cheering on the honks of support from passing cars. 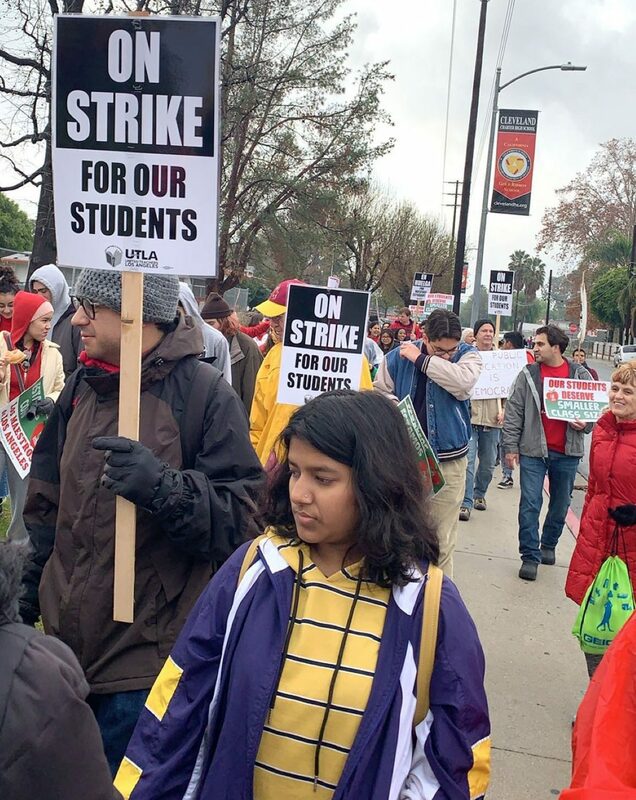 Filled with adrenaline, students and teachers alike continue to shout chants and keep the picket line moving for hours, never once complaining about the cold or being tired. “Out here picketing in the rain because that’s what our kids deserve! … The rain won’t stop us from fighting for a fair contract and better circumstances for our students,” Jessica Peroff, a teacher at Cleveland High School, wrote on her Instagram post. It is commonly misunderstood that the teachers are only fighting for better pay, but United Teachers Los Angeles makes it clear that they are striking because “a high quality, safe, fully funded and staffed public school is the right of every child.” This includes a smaller classroom size, nurses and counselors in every school, and support (financial and mental) for all students, in addition to higher wages for the teachers, although their pay could never reflect the time and effort that goes into the job, as well as their impact on our society. But for now, the plethora of umbrellas, red clothing, and picket signs will continue to be seen all over Los Angeles as the collective voice of teachers, students, and parents protest to better what has become of our public education.